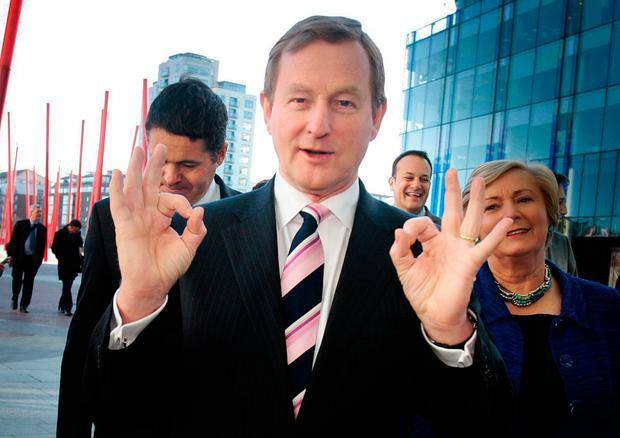 Day 2,234 in the Taoiseach's office and Enda Kenny has set a new record. Today marks a major milestone for the Fine Gael leader that seemed almost impossible after last year's General Election. 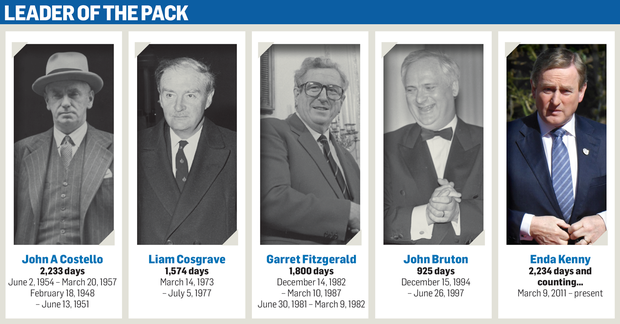 Having left Bruton, Cosgrave and FitzGerald in his wake, Mr Kenny has now overtaken John A Costello to become the longest serving/surviving taoiseach in Fine Gael history. When he took over a party as obsolete as Jeremy Corbyn's Labour in 2002, few would have predicted he could achieve such a feat. Without question he has had some luck along the way with the crude demise of Bertie Ahern and the inability of anybody else to cobble a government together last year. But nobody can question his stamina or determination to get to the top and remain there. Yet there was no flurry of statements from his TDs and senators last night to congratulate him on the much-flagged occasion. Instead of a reason to celebrate a legacy, TDs see today as another goal ticked off Mr Kenny's long list of reasons to cling to power. Ministers argue he deserved to be allowed to claim the record even though they have already moved on. The party has placed an order for ballot boxes so they are ready to roll with a leadership contest in the coming months. Behind the scenes officials are working on a plan to run a "short, sharp" election that could span two weekends. The first is likely to see hustings between Leo Varadkar, Simon Coveney and possibly others at four to five locations around the country. The second would be the actual election where TDs, senators, MEPs, councillors and members all have a say. In an ideal world they would like it to be tidied up before the Dáil takes its summer break on July 13. That would give the new taoiseach time to become acquainted with his/her responsibilities and the new Cabinet time to read into their portfolios. The truth is that for all the speculation in Leinster House and by the media nobody except Mr Kenny and presumably his wife Fionnuala truly know what's going on in his head. Part of his survival tactics over recent months has been to keep everybody guessing. The seemingly endless list of reasons to stay just plays into that. Today's date was one reason; the start of Brexit talks is another. Then there is the situation in Northern Ireland which won't be resolved any time soon. At one point Mr Kenny even added the 2018 visit of Pope Francis to the roll call - proving he is toying with the potential heirs to the throne. Theresa May's snap election could influence him to go while there is a vacuum in the UK - or it could embolden the notion that Mr Kenny is the only stable leader in a world gone mad. In some ways we should be grateful for that. There's little doubt the eagerness for a leadership contest is shared equally by the political establishment and the media. It seems everybody else has had a chance at change in the past 12 months but we've stood still - literally frozen by the advent of 'new politics'. But in the era of Trump, Brexit and Le Pen we might, in time, live to appreciate that while Mr Kenny is not exciting, he has steered a steady ship. So let's give him today to bask in the personal satisfaction of setting a new target for his Fine Gael successors - even if the occasion will be merely a footnote in his biography.